This dissertation work examines a range of creative tools available for media artists, and the benefits and limitations they offer. Luna is proposed as a novel system which co-locates distinct media in order to bridge disiplinary approaches to computer graphics. Luna combines tasks in computer vision (video processing), gaming (interactive rendering), motion pictures (physical simulation), and biological systems (organic modeling), to create a real-time system for work with media at a high level. Quanta incorporates a novel, non-relational database, to present a prototype for a visual internet. Quanta is a system for knowledge organization that brings together databases, ontologies, language representation, information visualization and distributed knowledge systems into a single interactive interface. 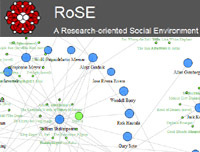 ROSE combines social networking with bibliographic resources to develop a social network of living and historic persons. Bibliographic data is mined from Yago and Project Gutenberg to create a database of 30,000+ authors and works co-existing in a social network with modern scholars. Interactive visualizations allow for navigation of networks of people and documents. Created with Ruby/Rails, ActionScript and Perl. This project demonstrates interactive, user control of fire and smoke during simulation. While these effects are common in motion pictures, realistic simulations require several days of computation, eliminating aspects of dynamic feedback found in other plastic arts. By utilizing GPU hardware for both simulation and volume rendering, this project demonstrates high resolution, creative control of an effect during simulation. This work is the first example of human-regulated formation of a gaseous nebulae. User control modifies the gravitational force and mass injection rate of a nebulae while the simulation unfolds. In the near future many fields, such as astronomy, will benefit from inexpensive, high performance parallel computing. The limiting factor in GPU-based computing is not cost, but the human coding of new parallel algorithms. Terrain rendering for interactive simulation began with military flight simulators. At the time, "dynamic terrain" referred to the ability to modify the terrain during simulation, to simulate explosion craters or bunkers. Recently, the term dynamic terrain is being used to discuss dynamic level-of-detail in terrain, although the terrain itself is still static. In this project, dynamic geomipmapping allows for both progressive level-of-detail and globally (not locally) deformable terrain at interactive rates. Fluids v.3 is a large scale, open source fluid simulator capable of simulating up to 8,000,000 particles on the GPU! Fluids v.3 is very efficient, running 4 million particles at 4.2 fps on a GeForce GTX 670. See website for downloads, development and performance details. ACM Symposium on Interactive 3D Graphics and Games, 2009. Fully interactive water streams present several computational challenges. This project focuses on the surface polygonization problem rather than fluid computations to achieve real-time water streams. Comparisons are made to video of real water. Graduate Workshop in Computer Science, UC Santa Barbara, 2008. A comparison of trends in SPH simulation shows major increases in performance due to GPU acceleration, but a drop in algorithm efficiency as the research community becomes familiar with parallel programming. A GPU-based simulation of fluids using CUDA was developed to compare CPU and GPU performance. Renderings show high quality fluids with shadows, SSAO and depth of field. A simple, effective tracking technique allows for markerless match moving of stationary cameras with unsteady motion. A variety of effects can be achieved including motion smoothing, digital compositing and matte construction without the need for full 3D tracking. Social Evolution is an experiment in simulated societies with evolutionary behavior. Character agents engage in a range of activities including standing, sitting, eating, sleeping, killing, mating, walking, raking (harvesting) and seeding (planting). Each character performs these actions in differing proportions, while their offspring evolve these traits to create unique, unexpected, global behavior. MINT/VXF is an open source multimedia framework designed to enable new media art and scientic research by providing a broadly designed meta-library for C++. Specific goals include support for common tasks in both science and the arts, such as tiled display rendering, and seamless video and device integration. GameX is a simple, 2D graphics and sound engine for incremental education in computer graphics. GameX provides an incremental API, allowing both novice and advanced students in computer science to create games while learning fundamental graphics theory, and collaborating in teams with students in the visual arts. Written in 1993, Raycast is a complete raytracer written in BASIC. Features included spatial partitioning, refraction, progressive rendering, Phong shading, Warn illumination, and shadow maps. Still images were created in 13 hours on an IBM Intel 80386. Monarch is a conceptual interface for a New Media Arts tool. Using simple, easily identified modules, the tool would allow artists to create dynamic, real-time artworks with sound, visuals and input devices without requiring programming experience. While the system is non-functional, in this prototype the interface was completely developed, with modules, zoom and pan, line routing, and smart connections. The VisualCell is software for biological simulation and modeling of virtual cells. Graphical user interfaces were developed to allow biologists to express, connect and measure reactions in simulated systems. 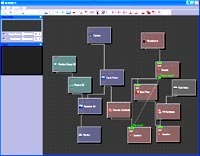 Unique contributions include overlayed graphs and automatic orthogonal line routing in the plane. These custom-made motion control boards were developed to drive robots for the BFA Thesis in robotic sculpture. High power relays are controlled by a PC computer. One system uses the parallel port to drive 8 bi-direction automotive motors, while another uses an automation card (Boondog) to drive sixteen 5-volt, 1/2 amp relays to control linear solenoids. The 3D Lego Digitizer scans 3D objects as point-clouds with 1 mm accuracy. The only non-lego parts are small mirrors, a camera, and laser. A "carriage" moves the laser beam to scan a plane across the object. A camera records this scan which allows the 3D object to reconstructed using laser strip triangulation. Built using inexpensive materials, this camera boom gives four degree of freedom. The 10 foot boom can dolly, pan, tilt and rotate the camera head. Experimentals videos were shot using a Panasonic DVX-100 camera against a green-screen with homemade sets.